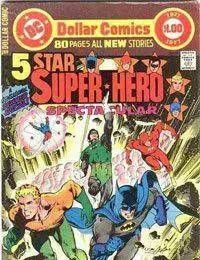 DC Special Series was an umbrella title for one-shots and special issues published by DC Comics between 1977 and 1981. Each issue featured a different character and was often in a different format than the issue before it. DC Special Series was published in four different formats: Dollar Comics, 48 page giants, digests, and treasury editions. Neither the umbrella title nor the numbering system appear on the cover; the title DC Special Series appeared only on the first page in the indicia. Most issues featured new material, but eight issues were reprints of previously published material.